You may very well want to link to an email address from with an article. It’s actually pretty easy, if you use the WYSIWYG (What You See Is What You Get) editor. 1) Navigate to the content item in which you want to create the link. 2) Then, select (or, highlight) that text. 4) Now, click the “link” button in the editor above the text box. 6) Fill in the email address, any CC or BCC that you wish, then enter the subject. 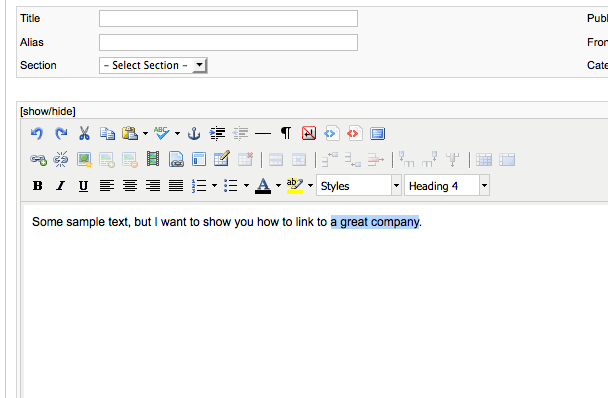 These parameters will make the link autofill these lines when a visitor clicks on the email link. 7) Click "OK" on the dialog box, then “Insert” in the popup box.